This versatile table adapts to your needs whether you are eating, working, or entertaining. 5 Piece Dining Set. Includes Round Glass Top Table, Measures: 40 Dia. 4 Chairs X-O Design In Soft Black Finish with Beige Textured Fabric Cushioned Seats. This Table set is Finished in a rich cherry color. The Curio can be sold seprately. Choose If youÃd like to add Arm chairs and Side chairs. Table also available in Two Sizes. Table Size: 40 x 60 x 30 In. (H). Other Table Size available: 42 x 72 x 30 In. (H). Side Chair: 41 In. (H). Arm Chair: 41 In. (H). Curio: 42 x 15 x 72 In. (H). Pulsar 5 Piece Dining. Includes Table with Wood Framed Glass-Pannel Top. Chairs with Fabric-Cushion Seats In Green Or Ivory Textured Finish With Gold Accented Pulsar Insignias. (To View In Green Color Click On The Picture.) Check Related Items For Pulsar Baker Rack Also Available in Green and Ivory. Measures: 30 x 46 inches. 5 Piece Tulip Dining Set.Includes Round Dining Table 2032 (ML) Featuring Bevelled Glass Top. Micro-Suede Cushioned Side Chairs 3032(ML) with Tulip Design Oval-Back in Gun-Metal Finish and Taupe Fabric.Table Measures: 42 Dia.Also Available Separately. Check Related Products For Matching Bar Set. 5-Pc Contemporary Style Dining Set In Espresso Finish. Set Features A Square Dining Table And Four Matching Side Chairs With Microfiber Seats. Additional Chairs Can Be Purchased Separately. Strong Construction. Easy To Assemble.Dimensions:Table: 38 In. x 38 In. x 29 In. (H)Chair: 19 In. x 17.5 In. x 37.5 In. (H)Rectangular Table Also Available. See Related Items Below. 5-Pcs MDF and Metal Dinette Set. Includes the table and 4 Chairs. Easy to assemble. Strong Construction. Available in Beech and Mahogany.Table Size: H 29 W 47.3 D 27.5 in.Chair Size: H 35.5 in. W 15.4 in. D 14.5 in. Solid Wood 5 Piece Dinette Set. Available in Oak or Mahogany Finishes. Easy to assemble.Table Size: 28 In. (W) x 45 In.(L). *In stock. This product normally leaves our warehouse within 1-2 business days. * Quantity Discount Available. Solid Wood Dinette Set. Includes the Table and 4 Chairs. Extra Chairs can be purchased separately in pairs. The table can be purchase separately. Easy to assemble. Strong Construction. Shipped ready to assemble. The Chair Pad is made of Bi-Cast Leather.Table Size: 42 In. x 66 In. *In stock. This product normally leaves our warehouse within 1-2 business days. * Quantity Discount Available. Solid Wood and Tile 5 Piece Dinette Set. Easy to assemble.Table Size: 30 In. x 48 In. *In stock. This product normally leaves our warehouse within 1-2 business days. * Quantity Discount Available. 5-Pc Contemporary Style Dining Set In Espresso Finish. Includes Dining Table With Four Side Chair With Microfiber Seats. Additional Side Chairs Can Be Purchased Separately. Strong Construction. Easy To Assemble.Dimensions:Table: 48 In. x 30 In. x 30 In. (H)Chair: 19 In. x 17.5 In. x 37.5 In. (H)Square Table Available. See Related Items Below. Solid Wood 5 Piece Dinette Set. Easy to assemble. Chairs are a strong Leatheret Material.Table Size: 36 In. x 60 In. Solid Wood 5 Piece Dinette Set. Easy to assemble. Includes a 12 In. Leaf. The leaf is self storing. The chairs will be as shown in the lower picture with the curved back.Table Size: 36 In. x 48 In. To 60 In. s e: 36 In. x 48 In. to 60 In. 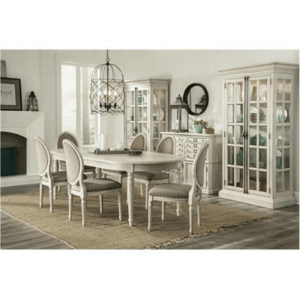 Table and 4 Chair Marble Look Dinette Set. Available in Black or Ivory. Welded Chairs. Strong construction. Easy to assemble.Table Size: 36 In. x 60 In. Available in Cherry and Wenge Finish. Easy to assemble. Strong Construction.Table Size: 30 In. x 31.5 In. x 47.2 In. Chair Size: 35.4 In. x 17.7 In. x 17.7 In.